Almost anything scares young Eleanor: mice, the dark, and a host of imaginary dangers. But she learns to hide her feelings-her father disapproves of fear, and she longs only to please him. She knows she will always disappoint her beautiful, socialite mother, because Eleanor is painfully shy and plain. As a young debutante in Manhattan, she spends her days teaching needy children and touring crowded tenements. There, she makes a life-changing discovery that later enables her to redefine the role of America's first lady - being shy doesn't matter as long as she's helping others. Winner of the Boston Globe-Horn Book Award and the Golden Kite award, Eleanor Roosevelt was named an ALA Notable Book and a YALSA Best Book for Young Adults. Author Russell Freedman creates a spirited portrait of the woman who overcame enormous personal obstacles to earn the title, "First Lady of the World." 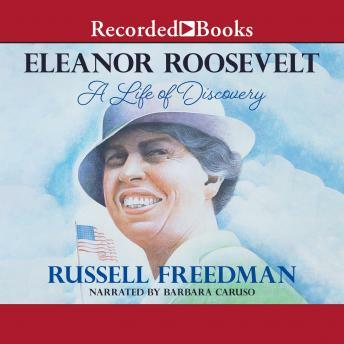 With Barbara Caruso's splendid narration, Eleanor Roosevelt's remarkable life unfolds with clarity and sensitivity.